CLEVELAND - When the first snowflake falls in Cleveland, people react like it's the first piece of radioactive debris from a nuclear bomb. With visions of being entombed alive in ice or snowed in at home and forced to resort to cannibalism to stay alive, they pack up their things and head to the sun spots. For golfers, it's a no brainer. Let's face it, snowshoes are not the typical golfer's footwear of choice. So they make plans to play seaside courses in tropical locales, or at least places where the temperature won't dip below 50 degrees. Lifelong Cleveland residents Lee and Loretta Chaplin have set their sites on Hilton Head Island every winter since the 1970s. They once owned a vacation property on the 16th hole of Harbour Town Golf Links, but now they own a home in Moss Creek Plantation just off the island. Even though the location of their getaway abode has changed, their love of the island remains the same. "We like the climate in Hilton Head, which is more temperate than Florida," says Lee Chaplin, a 71-year-old retired business owner. "There are seasons there, and it can get quite cool in December and January, although we don't get snow. We also like the low country, the marshes and waterways. And we like the people, too. They're very laid-back and friendly." The Chaplins typically play one of four courses: Devil's Elbow North Course and South Course (Moss Creek Golf Club) and Bloody Point or The Melrose Golf Course (both part of Daufuskie Island Club & Resort). 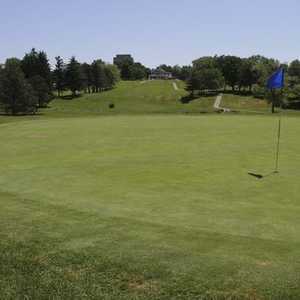 The private Moss Creek Golf Club is most convenient for them as it's located right in their plantation. "Both Devil's Elbow North and South are high quality, country club-level courses," Chaplin says. "Plus, the greens fees are reasonably inexpensive compared to other courses." But when the Chaplins are feeling more adventurous and are getting tired of their home course, they pack their clubs into their boat and head over to Daufuskie Island for links action at Bloody Point or Melrose. "It's like having your own private island," says Chaplin, a 26-handicapper who logs 50 to 75 rounds a year. "Both courses take up part of the shoreline so that four or five holes on each are right on the ocean." The name Bloody Point shouldn't scare anyone. The course got that moniker because it's built on historic Bloody Point, which supposedly was where vengeful English settlers ambushed the warring Yemassee Indians after suffering a raid on their settlements in 1715. today it's totally peaceful, and totally isolated. 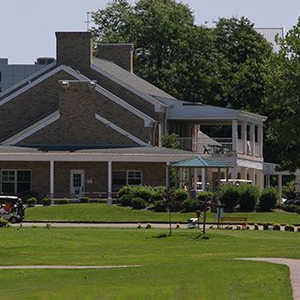 It was designed by Weiskopf/Morrish and is best described as a wide-open, park-like layout with no condos or housing surrounding it. The Melrose Golf Course, which Chaplin says is "maintained very well," is different than Bloody Point in that it has a tighter layout and winds in and out of residential areas, palmetto trees and swampy wetlands. A Jack Nicklaus design, it measures a whopping 7,081 yards from the tips and features lots of traps. The Chaplins, whose Ohio residence is in downtown Cleveland, typically stay in Hilton Head from the end of October until early June. They drive down ("It's 770 miles door to door," Chaplin says) as many Ohioans do because it's not an overwhelming journey. But the Chaplins wouldn't live on the island for half of each year just for the golf - there's much more about Hilton Head that makes their stay pleasurable and relaxing. "The restaurants are absolutely wonderful," says Chaplin. "The other nice attraction is that it's not too far to go south to Savannah, which has its own charm. You can also visit Charleston to the north quite easily, as well as Atlanta by plane." The Chaplins have been visiting Hilton Head long enough to have witnessed firsthand the large scale development that has occurred on the island. But the abundance of wildlife, pristine beaches and picture-perfect golf courses mean too much to them to let a few bulldozers drive them away. "Development is a double-edged sword," Chaplin says. "The traffic getting onto Interstate 278 gets bogged down every day when workers are coming onto the island or leaving it, but you just have to plan your day around it. It's not intolerable, but it is a nuisance." Mostly, it's the laid-back atmosphere of the island and the many golf course options that make Hilton Head the Chaplins' favorite island hangout. "If you go the store, you don't want to hurry because everyone's so nice and genuinely sincere," Chaplin says. "It really makes for a nice lifestyle."